It is beyond the scope of this handbook to incorporate a course of training in basic attitude instrument flying. This information is contained in FAA-H-8083-15, Instrument Flying Handbook. Certain pilot certificates and/or associated ratings require training in instrument flying and a demonstration of specific instrument flying tasks on the practical test. Pilots and flight instructors should refer to FAA-H-8083-15 for guidance in the performance of these tasks and to the appropriate practical test standards (PTS) for information on the standards to which these required tasks must be performed for the particular certificate level and/or rating. The pilot should remember, however, that unless these tasks are practiced on a continuing and regular basis, skill erosion begins almost immediately. In a very short time, the pilot’s assumed level of confidence is much higher than the performance he or she is actually able to demonstrate should the need arise. Accident statistics show that the pilot who has not been trained in attitude instrument flying, or one whose instrument skills have eroded, lose control of the airplane in about 10 minutes once forced to rely solely on instrument reference. The purpose of this section is to provide guidance on practical emergency measures to maintain airplane control for a limited period of time in the event a VFR pilot encounters instrument meteorological conditions (IMC). The main goal is not precision instrument flying; rather, it is to help the VFR pilot keep the airplane under adequate control until suitable visual references are regained. A VFR pilot is in IMC conditions anytime he or she is unable to maintain airplane attitude control by reference to the natural horizon regardless of the circumstances or the prevailing weather conditions. Additionally, the VFR pilot is, in effect, in IMC anytime he or she is inadvertently or intentionally for an indeterminate period of time unable to navigate or establish geographical position by visual reference to landmarks on the surface. These situations must be accepted by the pilot involved as a genuine emergency requiring appropriate action. The pilot must understand that unless he or she is trained, qualified, and current in the control of an airplane solely by reference to flight instruments, he or she is unable to do so for any length of time. Many hours of VFR flying using the attitude indicator as a reference for airplane control may lull a pilot into a false sense of security based on an overestimation of his or her personal ability to control the airplane solely by instrument reference. 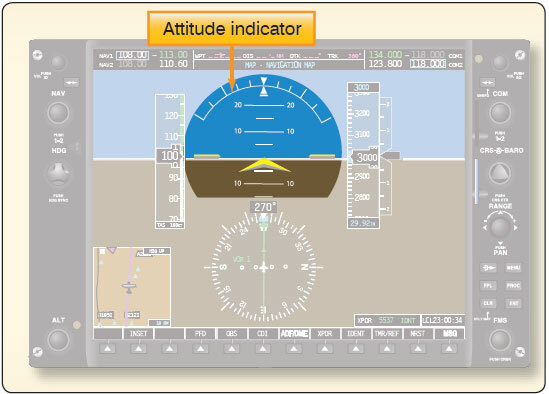 In VFR conditions, even though the pilot thinks he or she is controlling the airplane by instrument reference, the pilot also receives an overview of the natural horizon and may subconsciously rely on it more than the attitude indicator. If the natural horizon were to suddenly disappear, the untrained instrument pilot would be subject to vertigo, spatial disorientation, and inevitable control loss. Once the pilot recognizes and accepts the situation, he or she must understand that the only way to control the airplane safely is by using and trusting the flight instruments. Attempts to control the airplane partially by reference to flight instruments while searching outside of the airplane for visual confirmation of the information provided by those instruments results in inadequate airplane control. This may be followed by spatial disorientation and complete control loss. The most important point to be stressed is that the pilot must not panic. The task at hand may seem overwhelming, and the situation may be compounded by extreme apprehension. The pilot therefore must make a conscious effort to relax. The pilot must understand the most important concern—in fact the only concern at this point—is to keep the wings level. An uncontrolled turn or bank usually leads to difficulty in achieving the objectives of any desired flight condition. The pilot finds that good bank control has the effect of making pitch control much easier. The pilot should remember that a person cannot feel control pressures with a tight grip on the controls. Relaxing and learning to “control with the eyes and the brain,” instead of only the muscles usually takes considerable conscious effort. The pilot must believe what the flight instruments show about the airplane’s attitude regardless of what the natural senses tell. The vestibular sense (motion sensing by the inner ear) can and will confuse the pilot. Because of inertia, the sensory areas of the inner ear cannot detect slight changes in airplane attitude, nor can they accurately sense attitude changes that occur at a uniform rate over a period of time. On the other hand, false sensations are often generated, leading the pilot to believe the attitude of the airplane has changed when, in fact, it has not. These false sensations result in the pilot experiencing spatial disorientation. Trim the airplane with the elevator trim so that it maintains hands-off level flight at cruise airspeed. Resist the tendency to overcontrol the airplane. Fly the attitude indicator with fingertip control. No attitude changes should be made unless the flight instruments indicate a definite need for a change. Make all attitude changes smooth and small, yet with positive pressure. Remember that a small change as indicated on the horizon bar corresponds to a proportionately much larger change in actual airplane attitude. Make use of any available aid in attitude control, such as autopilot or wing leveler. The primary instrument for attitude control is the attitude indicator. [Figure 17-12] Once the airplane is trimmed so that it maintains hands-off level flight at cruise airspeed, that airspeed need not vary until the airplane must be slowed for landing. All turns, climbs, and descents can and should be made at this airspeed. Straight flight is maintained by keeping the wings level using “fingertip pressure” on the control wheel. Any pitch attitude change should be made by using no more than one bar width up or down.